I bought a juicer at a Boxing Day sale last year and have – to my own great surprise and delight – been juicing ever since. Folks, it’s amazing. You juice this stuff up and you feel like you can take on the world. I work at home, so I have the luxury of quitting what I’m doing and taking the 20-odd minutes required to prep and juice these veggies and then clean the juicer. I run one glass downstairs to my husband, who is usually on a call with a client and meets my arrival with a fist-pump of triumph, and then I drain my own glass, reveling in how awesome I feel before hitting the grindstone with renewed vigor. It took a few weeks of juicing regularly for me to notice a difference, but now I’ve gotten to a point where I feel all wrong when I don’t do it. And there are fringe benefits to juicing as well. I used to shy away from buying vegetables in bulk because there’s only two of us, and I thought we’d never get through them. Now, with the confidence that I can just throw things in the juicer if we don’t get around to cooking them, I’m a vegetable buying fiend. I prep my refrigerated veggies in advance – washing the kale, and trimming and washing the carrots and celery and any herbs. Non-refrigerated veggies (tomatoes, cucumbers, citrus, etc.) are all within easy reach. With all these vegetables at hand, I’m far more likely to throw some extras into whatever I’m making. As a result, I find that we also consume far more vegetables in our meals now that we’re juicing. Just because it can be juiced doesn’t mean it should. For example, never, under any circumstances, juice an onion. Trust me. Get the most bang for your buck. I find that most of the juice I get from kale comes from the stalks, not the leaves, so I pull the leaves off for salads and cooking, and I use the stalks for juice. 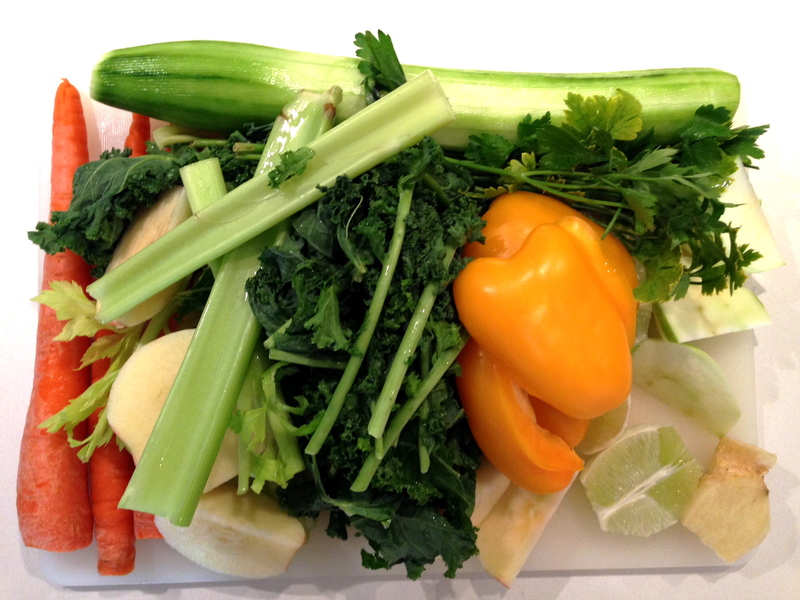 Similarly, I use the leafy parts of the celery and the stems of herbs for juicing, rather than throwing them out. Waste not. In the beginning, I saved the juice pulp to add to soups, sauces, and even baking. I have since failed to be that organized, although I do fertilize my herb garden with the pulp still. It seems oddly cannibalistic, but my herbs seem to love it. Buy organic when possible, and wash thoroughly. I soak all my veggies in a bowl with room-temperature water and a little baking soda before scrubbing and rinsing them. 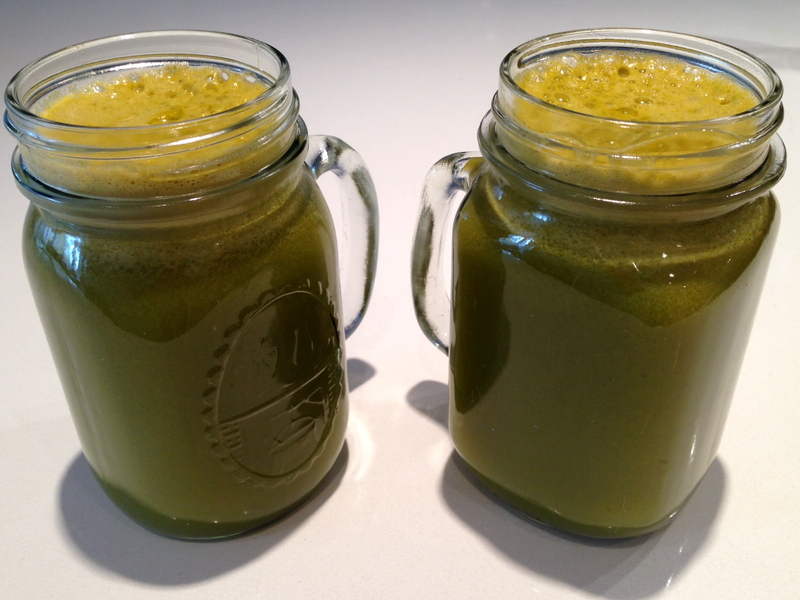 Juicing is time consuming, but it has become ingrained into our routine now, and it makes us feel amazing. I usually catch every bug that goes around, but this is the first year on record that I have held steady despite everyone around me dropping like dominoes as the brutal Canadian cold season sets in. Categories: Eli recommends, Endo Diet, Health, Juicing, Recipes | Tags: health, juice, juicing | Permalink.